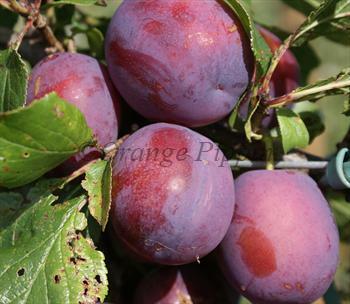 Marjorie's Seedling is the main late-season commercial plum grown in the UK - and also an excellent choice for the garden or small orchard. It is a good culinary plum, and very good for eating fresh when fully ripe. Marjorie's Seedling is attractive to commercial growers because it is vigorous, hardy, disease resistant, and a reliable and heavy cropper. These qualities mean it is also ideal for the garden or small orchard - and by growing your own you can also get a far better flavour than is possible for the commercial grower - the trick is to leave the plums on the tree longer. And if you like fresh plums, there are not many other ones around this late in the season. The fruit is large, plum-shaped, and purple, becoming blue-black when fully ripe, with a heavy bloom - overall very attractive. The flesh is greenish-yellow, juicy, quite coarse, and noticeably veined, wiht a good strong plum taste. The stone is clinging. For eating fresh make sure you leave the fruit on the tree as long as possible to get the best flavour - it is very pleasant straight from the tree on a cold autumn morning! 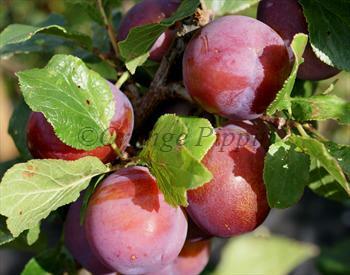 Please fill in the details below and we will let you know when Marjorie's Seedling plum trees are back in stock. An excellent late-season plum, arguably better for eating fresh than Marjorie's Seedling. Blossom wilt / Brown rot: Some resistance? Use / keeping: 1 week? Marjorie's Seedling is in flowering group 3. Marjorie's Seedling is self-fertile and does not need a pollination partner, although fruiting may be improved if there is a compatible tree of a different variety nearby. Since it flowers in the middle of the blossom season it can be pollinated by most other plum trees. Marjorie's Seedling flowers relatively late in the spring, so is a good choice for areas where frost is a problem, or for an east-facing situation. It is vigorous, hardy, highly disease resistant, easy to grow, and relatively untroubled by disease.